The backbone of any successful MLB franchise is a successful player-development system. And these days successful player development means strong MiLB and spring-training facilities. We rank MLB organizations by the quality of their player-development facilities, updated for 2019. There are teams with some definite player-development philosophies, like the Atlanta Braves, who prefer owning and operating their affiliates, and the Chicago White Sox, who centralize affiliates for the most part in North Carolina and the South. Others, it seems, don’t have much of a philosophical bent and evaluate each affiliate separately. We know every MLB team wants the perfect player-development system, but perfection is hard to achieve. Hence these ratings, which were first introduced in 2018 and have been updated for 2019. No black-box methodology here. We asked former GMs, broadcasters past and present, and journalists with expertise in specific leagues to rank facilities based on four criteria: player facilities, fan experience, proximity and stability. Player facilities include clubhouses, workout spaces, quality of batting/pitching cages, meeting spaces and cafeteria/nutritional services. The fan experience covers the physical condition of the ballpark, concessions and in-game entertainment. Proximity covers to what extent players are shuffled around; being closer to the MLB parent and other MiLB affiliates is always a good thing. Finally, stability covers the length of the current affiliation deal and expectations of the future. We cover every level of MiLB affiliation (including MiLB teams owned by the parent), as well as spring-training facilities. Spring complexes are increasingly used as year-round facilities: after spring training ends, complexes are used for rehabs, extended-spring workouts and potentially MiLB play, as well as hosting Rookie-league games. Each level of play was assigned a potential score in each category, with AAA and spring-training facilities receiving the highest number of potential points, decreasing by level of play. There are two teams with two Rookie-level affiliates—the Reds and the Royals—and that commitment to development is reflected in the scores. We asked our experts to limit their responses to ballparks and spring facilities they’ve actually visited, and their responses are reported here in aggregated form. No single opinion dominates any ranking, as multiple feedbacks are reflected in every instance. As noted, we present the rankings from bottom to top, with daily stories through Friday. No surprise that one of baseball’s oldest teams would emphasize stability and proximity in its player-development facilities, and the team’s rankings are also boosted with teams stressing the fan experience. Since the Pawtucket Red Sox (Class AAA; International League) decided on a move to nearby Worcester in 2021, the stability of the farm system remains intact for now. Other than a resolution of the PawSox situation, the Red Sox saw no changes in their player-development facilities for 2019. Shown above: the team’s spring-training home, JetBlue Park. The biggest jump in our rankings came from the Houston Astros, who added the Round Rock Express (Class AAA; Pacific Coast League) and the Fayetteville Woodpeckers (High A; Carolina League) to the fold. The new deal with the Express was widely expected thanks to the Ryan family connection in both front offices, and the Astros are reaping the benefits of playing two seasons at Buies Creek while a new Fayetteville ballpark was constructed. Add in solid affiliates in Corpus Christi and Quad Cities, as well as a very functional spring-training/player-development facility in West Palm Beach (shown above), and you have Houston building a very solid farm system. Another big jump in our rankings. The biggest reason for the climb was the shift of the Mets’ Triple-A affiliate from Las Vegas to Syracuse. While the Mets missed out on a new Las Vegas ballpark, the team does benefit greatly from having a much closer affiliate in upstate New York. Add in some ballpark improvements funded by the state, and the Mets are big winners. We also saw scores improve at the Double-A level, as ballpark improvements for the Binghamton Rumble Ponies (Class AA; Eastern League) and a rise in the stability score after PDC and lease extensions led the charge. 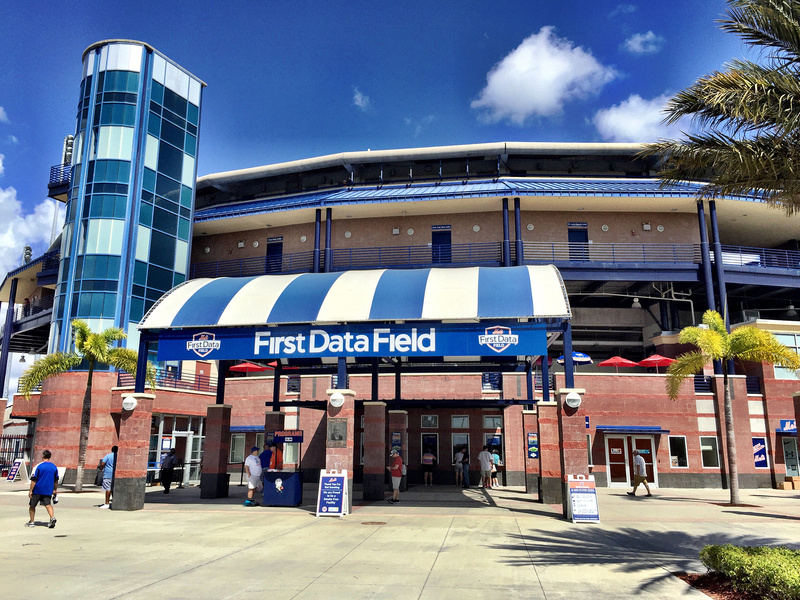 There’s still potential for improvement, as upgrades to First Data Field (shown above), which serves as home to spring training and High-A ball, should lead to a 2020 boost. Another system that stood pat from 2o18 to 2019, but from a position of strength. The Chicago White Sox oversee a stable player-development system, and that patience has been rewarded with teams building above-average facilities in Charlotte (shown above), Birmingham and Winston-Salem, with a new modern ballpark on the way in Kannapolis. The relatively low scores for Centene Stadium, home of the Great Falls Voyagers (rookie; Pioneer League), drags down the total score, as a team in Montana really doesn’t fit with the southern strategy the White Sox employ for player development. But the overall score should change in 2020 when a new Kannapolis ballpark comes on line. The Reds dropped from the top ranking in 2018 to a tie for seventh after a single move, shifting affiliations from the Pensacola Blue Wahoos (Class AA; Southern League) to the Chattanooga Lookouts (Class AA; Southern League). Still, this is a strong system from top to bottom, with a score boosted by two strong Rookie-level teams. Having a Louisville Slugger Field or a Fifth Third Field just down the road is definitely a plus, as are top-level facilities in Billings and Greeneville. Add in the historic value of playing out of Radiology Associates Field at Jackie Robinson Ballpark, home of the Daytona Tortugas (High A; Florida State League) and you have a player-development system of note. (Shown above: Goodyear Ballpark, the team’s spring home.) We’re getting to the point now where are slight differences between the systems, reflected in the tight scores.